What could be better than a freshly-brewed cup of coffee? Sit back, sip your Joe, and enjoy the magical flavors dancing through your mouth! To make a truly fresh cup of coffee, you can’t just start with a pot of water and your favorite ground coffee. No, you have to do the grinding yourself in the moment you are going to brew your cup of coffee. When it comes to the best coffee grinders for french press coffee, we’ve got you covered, but first, why grind at all? It exposes the oils to oxygen. When the essential oils in your coffee come in contact with oxygen, they oxidate or break down. The more the oils break down, the less there are when it comes time to brew a cup of coffee. Excessive oxidation can lead to weak coffee! It produces heat. The metal blades used to grind the coffee generate friction when they come in contact with the coffee beans. Heat speeds up the oxidation process. The aroma released into the air during the grinding is all coffee oils being burned, meaning there is that much less oil for brewing. Of course, that’s not even talking about the time the coffee beans spend exposed to oxygen before they are packaged and shipped, or when you have the coffee bag or container open. The more oxygen your coffee is exposed to, the more it breaks down. So, for a truly fresh cup of coffee, you want to grind the coffee IN THE MOMENT and use that beautifully fresh coffee ground to make a gorgeous pot. For French press coffee, you want a coarser, more even ground than the coffee you’d use in a coffee maker or espresso machine. You need to find a grinder that will deliver the right texture of grains for your French press. To that end, we’ve pored over the HUNDREDS of coffee grinders available on the market, read thousands of reviews, examined the specifications, and weighed the pros and cons of each. 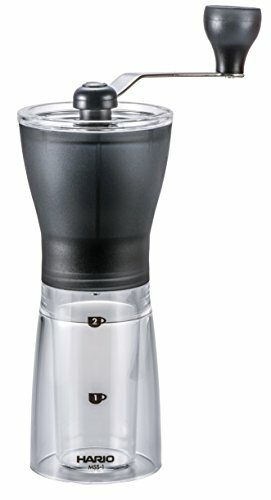 Our goal: bring you the top 3 best coffee grinders for French press coffee. 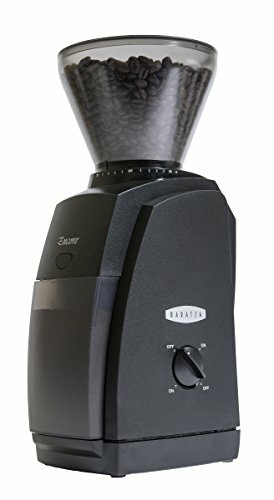 If you’re looking for one of the best conical burr coffee grinders on the market, look no further than this Baratza. It’s a perfect entry-level grinder to produce the best possible coarse-ground for French press coffee. The coffee grinder has 40 individual coarseness settings, allowing you to choose just how coarse/fine you want the coffee. You can grind coffee for your French press, but you can also produce a nice ground for drip brewing and espresso machines. The grind settings are accurate every time, and you can always get the perfect grind. The burr spins at a sedate 450 RPM, grinding those coffee beans without generating too much heat. 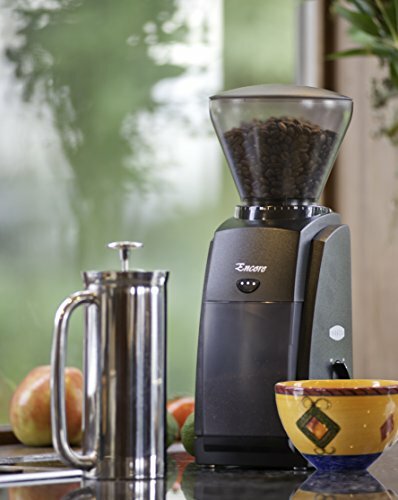 The DC motor is energy-efficient and designed to reduce motor heat, helping to keep the beans cool as you grind them. The machine has built-in speed reducers to keep the burr from spinning too fast, preventing oxidation of your beans. The bean hopper can store up to 8 ounces of coffee beans, and the ground bin can hold 5 ounces of fresh-ground coffee. The machine weighs just 7 pounds and takes up very little counter space. If you’re looking for excellent control over the coarseness and quality of your grind, this high-priced grinder is definitely the one to consider! With this machine, you get 25 individual ground settings, suitable not only for French press, but also espresso makers, drip machines, and percolators. 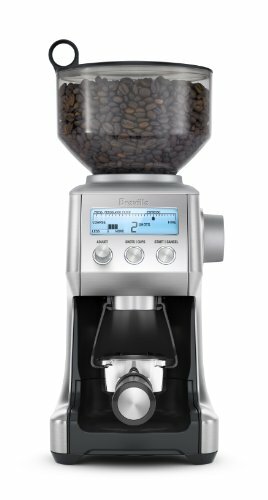 The LCD screen makes it easy for a precise grind, and you can use it to control grind settings, cups/shots, and the customized grind type. The Breville BCG800XL Smart Grinder has a built-in auto-dosing system that will produce precisely the right amount for each type of coffee you want to brew. There is a slight learning curve to understand the grinder fully, but once you do, you have total control over your coffee ground. The bean hopper can hold 16 ounces of fresh beans, and you’ll find that the conical steel burr grinders help to reduce friction and heat when producing a new cup of coffee. If you want hands-free brewing, you can attach a portafilter to the grinder and fill it directly. Now comes the sticky part: the price tag. For those who want cheap and simple, look no further than this hand-powered grinder. The Hario Coffee Mill grinder is designed to be easy to store in a closet or drawer, and you can remove the handle to make it more space-friendly. It’s simple to take the grinder apart and clean it. It’s easy to use: twist the knob to adjust the coarseness, add coffee beans, and spin the handle to grind. The ceramic mill is rust-proof and flavor-resistant, so you won’t have to worry about affecting the flavor of your coffee beans. At $19, this little grinder is a total steal. You can easily store it anywhere in your kitchen and pull it out when it’s time to grind the coffee. 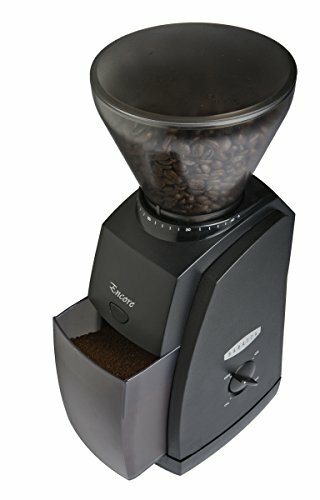 It will take a bit of elbow grease to make a very fine grind (for espresso machines), but for a coarse grind worthy of your French press, it’s the perfect budget grinder! Previous Post: « Is the Gaggia Titanium Super Automatic Espresso Machine Worth It?